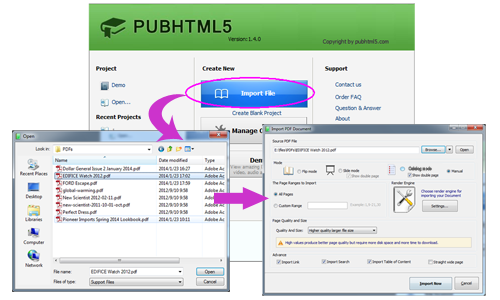 After you install and launch Pub HTML5, click "Import File" to browse your PDF (or MS Office file, images). And in the Import dialog, select mode and page range, set page quality & size, define advanced settings. In the Design interface, you can preview the page sliding effect of your publication. Now you can customize the publication with beautiful template, theme and other settings. 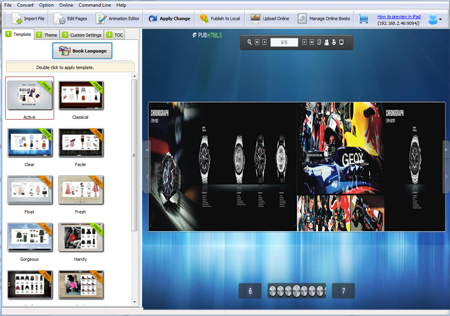 And you can enrich the slide catalog with rich media and animated elements using Page Editor and Animation Editor. 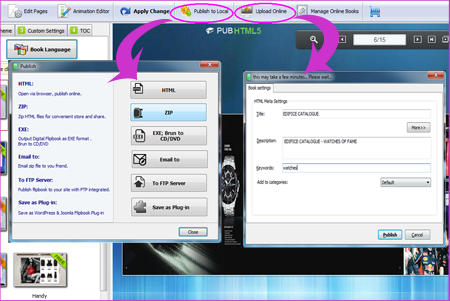 You can output your digital publication in offline version or publish it online directly. After you log in with your account, click "Upload Online" and you can upload the publication online to our Cloud Hosting.